State run Telecom Company Bharat Sanchar Nigam Limited (BSNL) Prepaid mobile Packs (Rate cutters) running in Kerala Telecom circle under GSM mobile services. 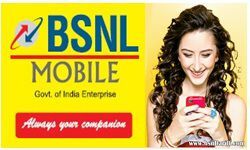 BSNL Prepaid users can make Reduced rate/Unlimited voice calls to both Local/STD for BSNL network and Other network. As well Reduced tariff/Unlimited data browsing using Data Vouchers available in Kerala Circle. BSNL Prepaid mobile users can activate the below Special Tariff Vouchers of Data, Voice, SMS, ISD, Free National Roaming, Combo and Unlimited data/Unlimited Voice STVs by approaching nearest BSNL Customer Service Center or nearest BSNL Channel partner or Retail outlet or by sending SMS through Self care services from mobile. BSNL Tariff Plans Info © 2017. All Rights Reserved.